The Radio Burp from Dark Matter’s Lunch? If Astronomers hosted the Grammys, Fast Radio Bursts would likely be New Artist of the Year (and these guys would win Best Choreography). Fast Radio Bursts (FRBs) are extreme bursts of radio emission that last for a few milliseconds. They were discovered in 2013, and, in 2014, the number papers on FRBs skyrocketed. The origin of these transients is still uncertain — we can’t even agree if they are extraterrestrial! Astrobites has already covered two possible origins: stellar flares and neutron star mergers. Today’s paper suggests an even more exotic source: dark matter annihilation of neutron stars. 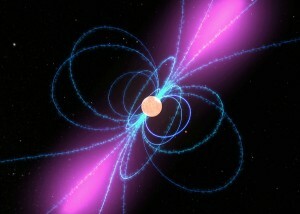 Artist’s depiction of a pulsar [Wikipedia Commons]. There has already been a suggested solution to the “missing pulsar problem”, which involves another mystery character: dark matter. Dark matter is the mysterious stuff that constitutes roughly 30% of universe but that we know almost nothing about. Our best guess is that dark matter is a new type of particle, but its mass and properties are highly uncertain. Given the “correct” set of physical properties, dark matter may be able to “eat” neutron stars from the inside out. Dark matter particles may scatter off the surface of neutron stars, heat up and sink to the cores. In the core, the dark matter particles can accumulate to push the neutron star above its critical mass. This would create a black hole which would swallow the neutron star. You don’t need a lot of dark matter to trigger black hole creation— only about an asteroid-sized amount; however, because dark matter is unlikely to interact with nucleons, the density of dark matter must be extremely high. And where is dark matter density the highest? In the centers of galaxies, where pulsars appear to be missing! Are Fast Radio Bursts Collapsing Neutron Stars? High dark matter density may help neutron stars collapse. The top panel shows the toy galaxy’s dark matter density (ρDM) and stellar density (ρ* ) as a function of distance from the center of the galaxy. The bottom panel shows the cumulative FRB rates which are concentrated near the center of the galaxy. The inner part of the galaxy (with the largest ρDM) has the greatest RFRB. So what role do Fast Radio Bursts play in all of this? Today’s paper suggests that FRBs are the astrophysical burp caused by the black hole gobbling up the neutron star. The authors show that the energy released and the millisecond timescale of the FRBs roughly match what is expected from a collapsing neutron star. Additionally, the authors estimate how often FRBs should occur if they were caused by collapsing neutron stars. To do this, they construct a model galaxy with the large dark matter density necessary for black hole formation. They estimate how many neutron stars form yearly in the model galaxy and give a very rough estimate of how many FRBs we should see. Fig. 1 shows the model galaxy’s dark matter distribution and estimated FRB rate. They find that there is about one FRB every one hundred years in a single galaxy if their theory is correct. Extrapolating to the night sky, they estimate that about 5,000 FRBs should occur every day. This is about half the FRB rate that we currently see in observations. Dark matter has well specified properties: Currently, the properties of dark matter are highly uncertain. 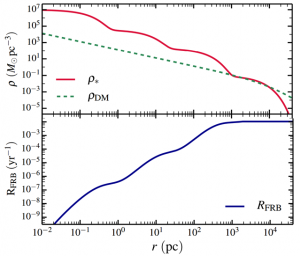 This theory provides tight constraints on dark matter’s interaction rate with baryonic matter. Dark matter needs to accumulate quickly enough in the neutron star to not radiate away due to Hawking radiation before eating the neutron star. It also needs to accumulate slowly enough that pulsars can exist in regions far away from the galactic center. The missing pulsar problem should be astrophysically real: Neutron stars and pulsars should really be missing from the center of our galaxy, and there should not be an observational explanation for why we have not seen them. Additionally, in the place of these missing pulsars should be solar-mass black holes which have eaten up all the neutron stars. The basic properties of FRBs should hold: FRBs should still be fast, occur only once and exist predominantly in the radio. This study also finds that FRBs should be clumped near the centers of galaxies, where the dark matter concentration is high enough to facilitate neutron star collapse. Dark matter preying upon neutron stars and belching the remnants our way is certainly an exciting theory, but, for now, the source of FRBs remains a mystery. We’ll have to wait and see what new insights and observations 2015 will provide to us about these elusive events. How do the particles both scatter off and sink to cores of the neutron stars? 2. When you say “…a black hole which would swallow the neutron star…” and “… black holes which have eaten up all the neutron stars”, are you referring to collapse of a neutron star to form a black hole. Somehow I have difficulty in picturing them as two separate entities (assuming they originated from the same star). Isn’t Hawking Radiation associated only with certain black holes? 1. I mean “scattering off” as a colloquial way to say that dark matter particles need to interact with nucleons in the neutron star. This is what allows them to heat up. 3. I’m unfortunately not sure about this question. To the best of my knowledge, scientists believe that Hawking radiation should affect all observable black holes. 2. Wow! I didn’t quite realise how incredible, in every sense of the term, this process was. 3. I used ‘certain’ to be on the safer side, but my actual question, which I now see was rather poorly posed, was whether neutron stars too emit hawking radiation, as per the part which I quoted. Neutron stars (at least, neutron stars without a black hole in their center, which presumably is the vast majority of them) do not have event horizons and so will not emit hawking radiation. All black holes are (theorized) to have Hawking radiation. However, for solar mass and largerl black holes, the Hawking radiation is tiny and can be ignored, even on 10 billion year time scales. But, a black hole with a mass of ~7 x 10^7 kg will only last about a year, one with a mass of 7 x 10^9 kg will only last a million years, etc. In this case, they hypothesize small black holes made from a collection of dark matter microparticles, where the formation mass is uncertain. If the formation mass is small enough that the lifetime of the hole from Hawking radiation is < 10^10 kg or so, or this mechanism won’t have the desired effects. Note, by the way, that this is NOT the same mechanism as the collapse of an overly large neutron star into a black hole. These black holes will initially be much smaller than a proton, and will thus eat slowly, at least in the beginning.